Fung Chi Ming: The type of man-powered transport known in English as “sedan chair” has different regional names, including jiao (轎) in China and kago (駕籠) in Japan. In Hong Kong, where it is no longer used as a means of passenger transport, it is known in local Cantonese dialect as san-dau (山兜, “mountain cabin”), kin–yue (肩舆, “shoulder carriage”) and chuk-kiu (竹轎, “bamboo sedan”). 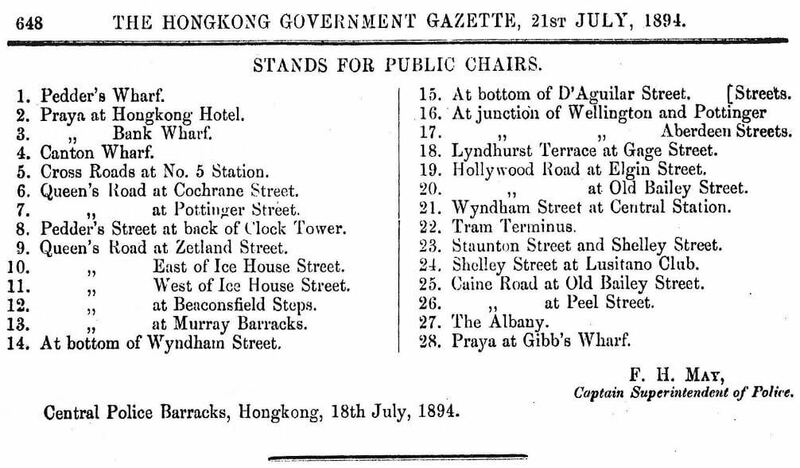 In Hong Kong, public (for-hire) sedan chairs were of two main types. 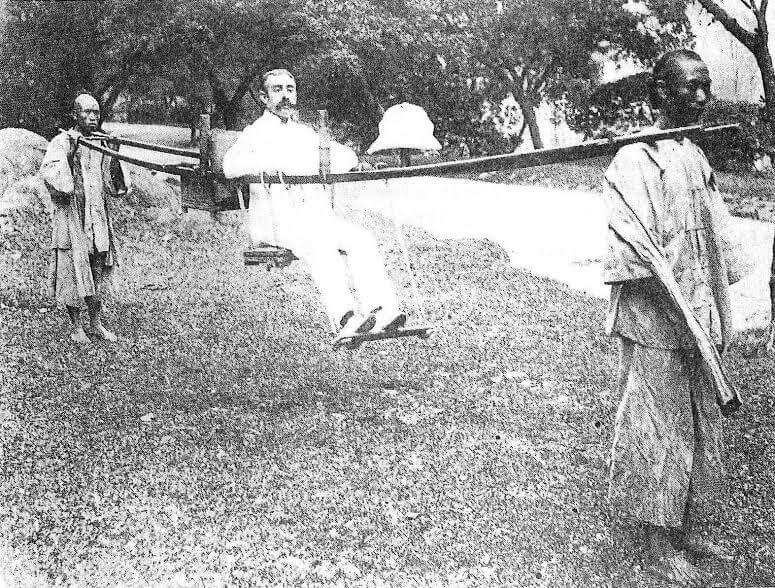 The light-weight ones consisted of a seat of rattan affixed to two bamboo poles, having a narrow board linked by two cords for the purpose of resting the feet of the passenger. 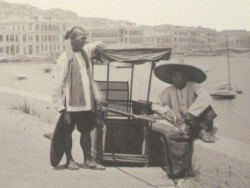 The more elaborate sedan chairs were enclosed and fitted with overhead canvas hoods for protection against sunshine. Indeed, the Registrar General and Captain Superintendent of Police of the Hong Kong Government could direct that certain parts of the street space be set aside as places where unengaged sedan chairs should stand ready for public hire. They could also specify and revise, subject to approval by the Governor in Council, the scale of fares for public sedan chairs to be charged. 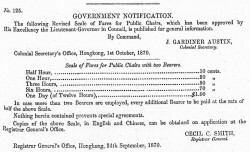 Sedan chairs remained a widely used means of city transport in early 20th century, so much so that in 1901 the Governor Sir Henry Arthur Blake appointed a commission to enquire into the causes of public complaints about the difficulties of procuring and retaining carriers for private sedan chairs and rickshaws (The Hong Kong Government Gazette, November 30, 1901). Sedan chairs that came into use in Hong Kong were locally made. 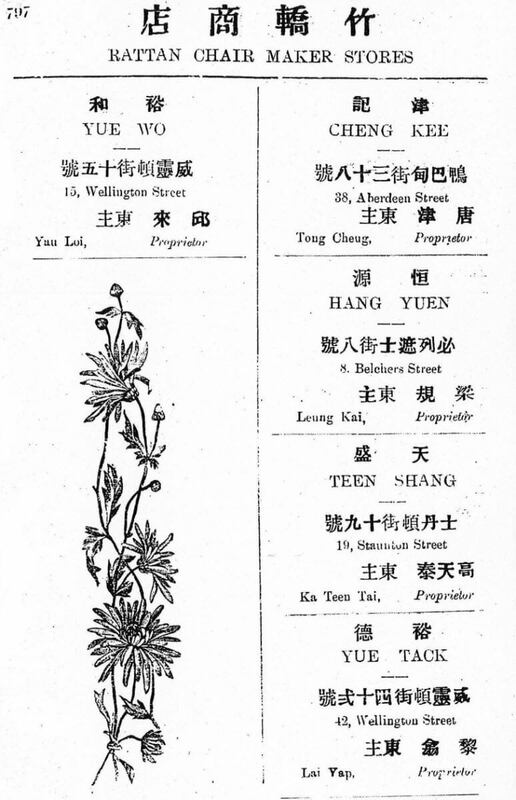 The Anglo Chinese Commercial Directory, published in 1915, records five “rattan chair maker stores” under the store names of Cheng Kee (津記), Hang Yuen (恆源), Teen Shang (天盛), Yue Tack (裕德) and Yue Wo (裕和). Two of them were located in Wellington Street, the others in Aberdeen Street, Belchers Street, and Staunton Street. 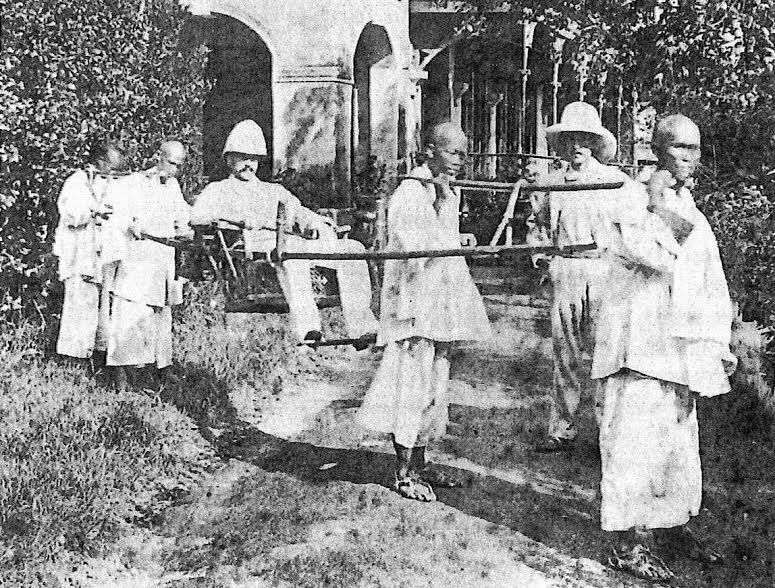 More and more people deplored the use of human beings as “beasts of burden” and protested when sedan chairs were shown in cinema pictures or posters, especially after the first road going up the Victoria Peak by cars were completed in 1920. In the year 1936, the Hong Kong Travel Association’s poster, with a sedan chair being carried up the Peak, was much resented (South China Morning Post, April 8, 1936). Licensing records show that sedan chairs became progressively fewer in Hong Kong. There were 219 sedan chairs in 1939, compared to 451 in 1933, 731 in 1927, and 1,173 in 1922. During that same period the number of registered cars rose from 595 to 5,209 (Figures from annual reports of the Police Department, various years). Due to the shortage of cars and fuel, human transport revived during the Japanese Occupation. The sedan chairs which had begun to fall out of use before 1941 became a means of transport of the rich. 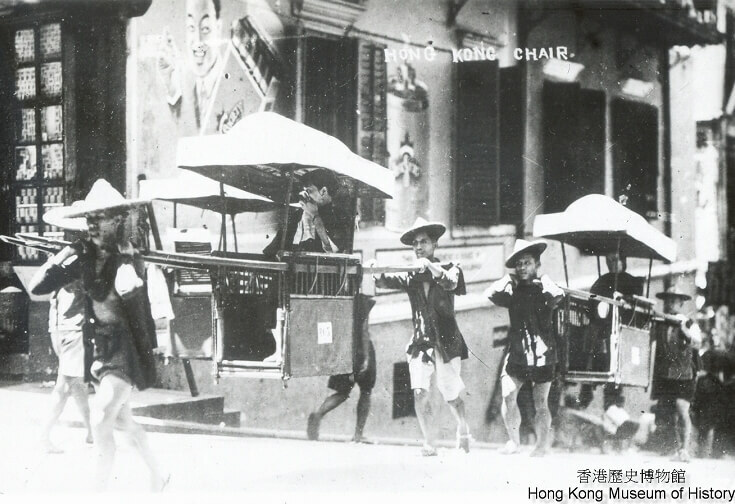 A Hong Kong Sedan Chair Syndicate (香港駕籠組合) was formed in 1943 at the behest of the Japanese, with an aim to supervise the trade such as the scale of fares to be charged (Wah Kiu Yat Po, July 17, 1943). After the war, sedan chairs were increasingly squeezed off the roads. 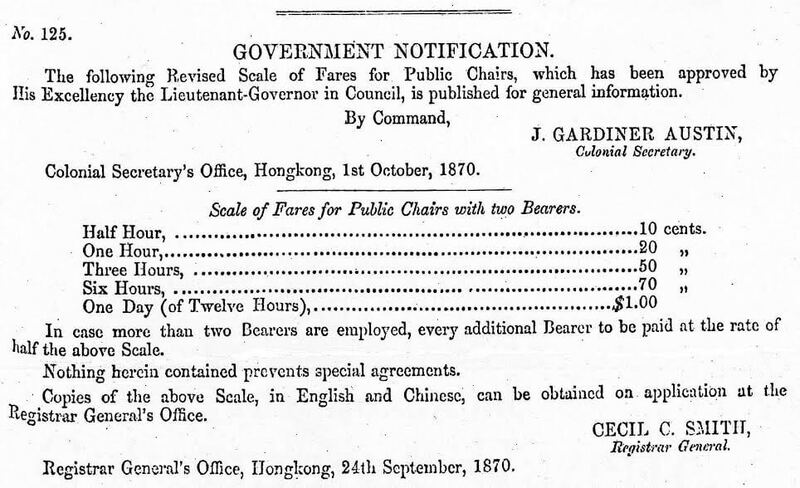 No sedan chair was re-licensed since the early 1960s. In February 1971, Jill Doggett of South China Morning Post wrote a story of two sedan chair carriers, aged 71 and 74, who still plodded their way in Wyndham Street. Soon afterwards, the last public sedan chair went out of use, thus marking the end of an era in Hong Kong’s transport history. This article was first posted on 12th May 2015. Very interesting. 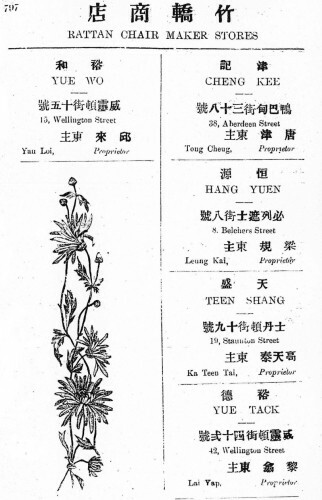 Researching the streets and transport of Hong Kong.